Home > Made in the USA > Antibiotics > Bene-Bac Plus Pet Powder, 1 lb. Healthy digestive track. Happy pet. And happy owner, too! Bene-Bac® Plus Powder can help make this idea a reality! Bene-Bac® Plus contains live, naturally-occurring digestive bacteria found in the intestinal tract. This aids normal digestion during stressful times and is often recommended for animals during adverse conditions, such as antibiotic therapy, post-surgery, birth, weaning, worming or traveling. This product contains probiotics and FOS, a prebiotic to support the growth of probiotic bacteria. It guarantees 20 million CFU of viable lactic acid-producing bacteria per gram. Bene-Bac® Plus Powder can help small animals in several ways. First, it aids bottle-fed mammals by supplying a probiotic to speed growth of needed bacteria in the gastrointestinal tract. Most newborns would start to acquire this while nursing from their mother. Cases of diarrhea in mammals, birds, and reptiles leads to a rapid loss of fluids; Bene-Bac® Plus Powder helps replace this and encourage recovery. Additionally, antibiotic treatments for other ailments kills both the good and bad bugs in the intestines; Bene-Bac® Plus Powder can help re-establish the good bacteria to restore total health. Stressful situations also upset the natural balance of the GI tract. With seven different bacteria; Bene-Bac® Plus Powder can help correct a stomach's normal pH balance. 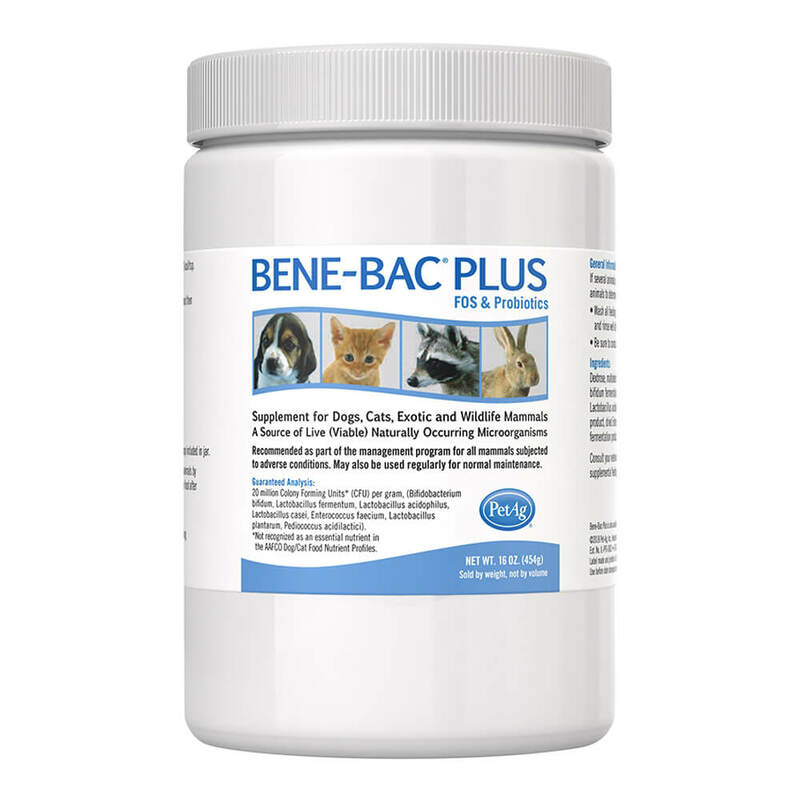 Animal stress from traveling, new environments; dietary changes and other health issues can be improved with this product; Bene-Bac® Plus Powder benefits newborns, meanings, orphans, mammals, birds and reptiles as well as during antibiotic therapy, post-surgery and more cases. Feed animals by top dressing food. One level teaspoon equals 2.7 grams of powder. Initial feeding: treat on days 1, 3, 5 and 7 and then give one feeding a week until weaned. Up to ½ lb., give ¼ tsp; ½ -1 lb., give ½ tsp; 1-5 lbs., give 1 tsp; 5-20 lbs., 2 tsp; 20+ lbs., give 3 tsp. Discard uneaten food after 8 hours and thoroughly wash dishes. Dextrose, Maltodextrins, Sodium Silico Aluminate, Dried Bifidobacterium Bifidum Fermentation Product, Dried Lactobacillus Fermentum Fermentation Product, Dried L. Acidophilus Fermentation Product, Dried L. Dasei Fermentation Product, Dried Enterococcus Faecium Fermentation Product, Dried L. Plantarum Fermentation Product and Dried Pediococcus Acidilacticii Fermentation Product.